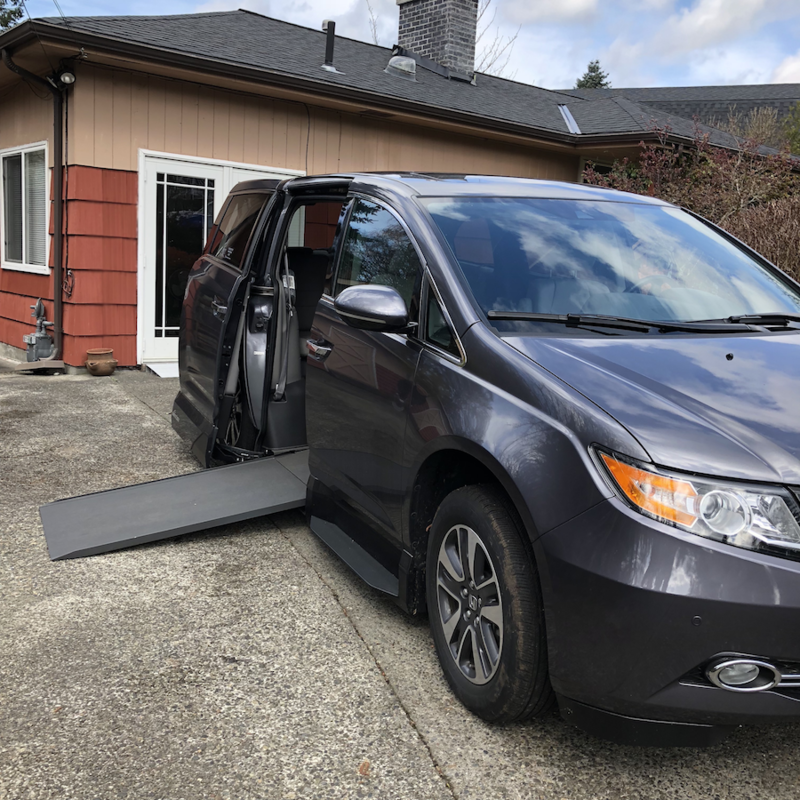 Meet the newest member of our household a 2016 Honda Odyssey Elite, all tricked out with hand controls and converted, with VMI system components, for my wheelchair by Kersey Mobility, Redmond. I’m not driving it yet. We got the van just as So Lucky was hitting shelves, so although I have a new learner’s permit, and I’ve been out once in the van with an instructor, I’m way short on the hours of practise I need to be competent. Unlike most Americans, I didn’t get my first driver’s licence until my 30s, then I didn’t drive often, and as soon as my right foot became unreliable I surrendered my licence. So in many ways I’m a beginner, so right now I’m mostly a passenger. I’ll talk about the minivan conversion from the perspective of both passenger and driver. The middle seats have been removed, the car jacked up a bit on its axles, and the floor lowered, so that there’s headroom in a wheelchair. Image description: A grey minivan with pale grey leather upholstery. The passenger side sliding door is open and ramp extended. Inside, the middle seats have been removed and a grey metal box bolted to the floor. To make it safe to drive with my wheelchair in the car, we had to attach a heavy bracket, flange kit, and docking bolt to the underside of the chair. I’m not sure of the exact weight but I’m guessing the whole assembly adds at least 11 kilos/25 lbs. Those who have lightweight folding manual chairs: this is not the system for you. Once you attach that bolt you cannot fold the chair. And the chair is no longer lightweight. This system is designed for heavy power chairs. I can make it work with my chair because of the power assist. Without power assist even an 8-degree slope would be too much with the added weight. Here’s a close-up of the station, and a diagram to show how it works. Image description: A photo (top) and line drawing (bottom) of the QLK-150 wheelchair docking system. The metal box is about 8:5″ square and 2″ high. A docking bolt on the underside of the wheelchair slides into a V-mouthed tapered channel and engages a locking pawl which secures the chair. The extra weight is worth it to me because the docking bolt means that even in a crash, the chair is secured. It also means that once I’m locked in, I can swivel on the spot to access the front driver’s seat. Once I’m locked down, and have spun about in place, I can transfer to either the passenger side or the driver’s side. Right now, as I’ve said, it’s mostly the passenger side. It’s harder to get into that than the driver’s seat, though, because the whole van conversion was designed with me-as-driver in mind. So once I’ve swivelled, I lean forward and toggle a switch on the side of the B&D Independence Transfer Seat Base driver’s seat and it glides back on its rail. Another toggle and the whole seats swivels facilitating an easy transfer from wheelchair to seat. Image description: A woman sitting in a wheelchair in the centre of a minivan. The driver’s seat has slid back on rails embedded in the floor, and swivelled 45 degrees to align with the wheelchair. Image description: A photo of a Honda Odyssey driver’s chair on a railtrack system with footplate and swivel base. To the lower right is a kidney-shaped metal attachment with three toggles radiating from the centre, and protected from accidental engagement by a metal guard. Once in the driver’s seat, I hit the two toggles in reverse order, and the seat swivels and glides back into driving position. This is what I see when I get there. That shiny metal button in the lower right quadrant of the multi-button panel is the electronic bypass to switch from foot-pedal-and-steering-wheel operation to hand controls. As Kelley currently does the driving, this button is mostly unlit—and the electronic bypass off—so she can drive with both hands and feet. Image description: Photo of the lower control panel below the dash and to the left of the steering wheel. On the left of of the photo is a large panel with eight different controls, one of which is a simple chrome push-button. To the right, two rocker-buttons (labelled Kneel and Ramp) are inset over a square panel labelled with a big lock symbol and red sound-alert icon. Note the rocker button that makes the van kneel to reduce the slope of the ramp. We often turn kneeling off. We live in a big, busy city. Traffic is horrible and parking spaces on the street (at the book shop, by the pub, at the café and the bakery and the library) are at a premium. Go back and look at that first picture; note how far from the main body panel the door comes out when open. Note, too, the flare at the bottom of the door added to cover the lowered floor and ramp workings. This makes the door longer than that of an unmodified vehicle. In order not to grind on the sidewalk when opening, the manufacturer recommends that the car be at least 14 inches from the kerb. That’s impossible in most of the places we park: we’d stick out into traffic and be dinged, dented and sued in a heartbeat. So we turn the kneel off, and where the sidewalk is low (in older neighbourhoods) we can park right up against the kerb. And I just cope with the increased ramp slope. Image description: The centre console of a Honda Odyssey Elite minivan. A small screen at the top; beneath that, to the left, the red start button and the gear shift. In the centre a large screen with a multitude of knobs and buttons. Below that a retracted cup holder. And below that, a refrigerated cool box. This is where—to someone who until recently still owned her very first car, a 1992 Toyota Paseo—things start to look a bit like a spaceship. The top part, though it looks like the radio, isn’t; it’s the nav, video screen for the backup cameras, and display for proximity warnings. Trust me, when you’re driving with hand controls you need this stuff because it’s hard to turn and look behind you when both hands have to be on brake/gas and steering at all times. I’m relatively flexible, but I’m not the woman from The Exorcist; my head does not swivel 180 degrees. Below that is the entertainment system controls. There’s a wide-screen HD Blu-Ray DVD with wireless headphones for rear passengers, with a sound system to match. And it’s a great sound system: 650 watts and 11 speakers. Here’s the thing, though: it doesn’t sound as good as it should, because it’s difficult to properly soundproof and converted car carrying a ramp in its belly. On the interstate things get loud. But, hey, so does the sound system. A recent road trip to Portland worked out just fine. Below that is a very nifty extra: a powered cool box. That is, a box that can keep drinks refrigerated. Seriously, going to a picnic in the park? Put your Champagne and caviar in here, baby! I haven’t actually tried it yet—because still not reliably summer here in Seattle, hence the mud—but I suspect it would fit. A split of bubbly certainly would. This car is designed for family-sized everything. Image description: Dark grey leather steering wheel with dark grey push/rock hand controls attached to the steering column and sticking out on the left, and a high-tech spinner knob attached to the wheel at the four o’clock position. Image description: A schematic of a Sure-Grip spinner knob. It is shaped a bit like a Thor’s Hammer amulet, with the thick T-bar at the top. Several controls are labelled. Starting at the lower left and moving clockwise: Horn; Click: Flash to pass, Hold: Dimmer Latch; Left Turn; Right Turn; 1st Click: Intermittant Wiper, 2nd Click: Low Wiper, 3rd Click: High Wiper, Hold: Wash; Wash. This high-tech spinner knob seemed like a good idea at the time, but it’s actually proving tricky. Perhaps it’s just because I’m such a beginner and grip the thing too tightly, but the first time I tried it, I kept turning the windscreen wipers on, and setting off the turn signals. If I need to, I’ll reprogramme it. If that doesn’t work I’ll just get a basic spinner knob and figure out how to manage all the other controls while both hands are already vitally occupied with brake/gas and steering. I’m sure it’s possible, but if I can make this method work, I think it would be safer. You’ll see that I currently have two different attachments for the spinner knob. Everyone (that is, my driving teacher and conversion mechanics) wants me to use the one at 2 o’clock, but I originally learnt to drive from an advanced defensive-driving expert, and I learnt to keep my hands low—4 and 8—and feed the wheel through my hands. I can’t do that anymore, of course, but I still much prefer a lower, symmetrical stance. But I’m just starting out in this van, so if I change my mind, I can. Once I’m sure which one I want, I’ll have the other removed. The red button visible on the top socket is what makes it easy to pop the spinner knob off the wheel for two-handed drivers. On the other side of the wheel is the FeatherLite Sure Grip Push/Rock: push to brake, pull to accelerate. It’s extremely sensitive. This is what it looks like when I’m actually at the wheel. Image description: Photo taken through the open driver’s side window of a woman sitting at the wheel, left hand on a push/rock lever and right hand on a spinner knob. The van is not perfect, but it makes a lot possible that was not before. Parking. I’ve already talked about that. In a small town or a less-dense city, it wouldn’t be a problem. Here in Seattle, it’s a significant downside. Even those places that should have excellent disabled-access parking—hospitals, universities—do a seriously crap job. Two weeks ago I had an appointment with my neurologist at Northwest Hospital, part of the University of Washington system, and there wasn’t a single van parking space. There were plenty of disability spaces, but none with the striped pavement next to them, the 8 feet of additional space I need for the ramp and manoeuvring at the bottom of it. UW has just been sued for their inaccessible campus parking, so they will be fixing the problem there. I’ll be tackling the hospital soon and expect to get a good response. Meanwhile: those spaces are inaccessible to me on my own; it would be easy to get trapped if someone parks next to the van. With Kelley driving it’s no problem; she can get into the van without a ramp, back up, drive to an open space with room, and I can get in. Size. The size has an impact on parking (see above) but it also has an impact on cost (see below). Mileage is not great on this van; the conversion makes it extra heavy. City driving is awful in terms of mpg: 15 on a good day with careful driving. Longer trips are much, much better: 25 mpg or more in Economode. Cost. People say you can’t put a price on freedom but in this case I can. This van is insured for $91,300.1 That’s how much it would cost to replace. I will be driving it for a long time. Freedom! Ease of movement! Independence! I cannot tell you how amazing it will be to have free and spontaneous movement again after so many years. We live at the bottom of a steep hill in a neighbourhood without sidewalks and many blocks from a bus stop. The only way for me to leave the house is in a car. Uber and Lyft have no accessible vehicles in Seattle. There are a handful of wheelchair-accessible taxis but you have to book way in advance, they are obscenely expensive, and, worst of all, utterly unreliable. Once I have my licence I can go anywhere, anytime I want (assuming I can park when I get there). I don’t have to ask a favour from anyone. I don’t have to fit in with another’s schedule. Our second car, a Mazda 5, was big enough for the wheelchair—if we dismantled it first, which meant taking the heavy wheels off (they weigh about 25 lbs each). That took two of us: me to sit sideways in the passenger seat, tilt the whole thing back on its anti-tippers, and Kelley to slide off each wheel, then secure each part separately in the back of the Mazda with a system of bungee cords and tie-downs. And no matter how well we tied it all down, it still rattled when we turned every corner, braked at every light, and thumped over every pothole (and, hey, it’s Seattle–lots of those). If it’s pouring with rain (and, hey, it’s Seattle) we’d look like drowned rats by the time we even began the journey. And when I’m tired it was just too much damn trouble. This van makes an incredible difference. I can go where I want! Even when I’m tired! The chair is secure! 1 We had help from the Washington State Division of Vocational Rehabilitation. It was an epic two-year process that deserves its own post. Wow! Good for you guys! Enjoy the ride. I sometimes wonder if you know what an increible source of inspiration you are…as a writer and author, as a person. I remember that blog post where you were zooming around in your chair in UK while finishing up your Doctorate. You approach life head on, and that inspires me and many others. Thanks. Serious mobility and a built-in vacuum cleaner! Excellent. Congratulations on the new car! I am in awe of the built in cooler and built in vacuum and the amazing gliding seats. Not to mention the hydraulic magic of kneeling vehicles and retractable ramps. It’s like the batmobile, only more useful! I’m extremely pleased that you are becoming more mobile and for the greater freedom that offers you. Excellent! @6:53 The fortune isn’t that small! I think almost 6 figures for a vehicle is close to obscene. But if you can afford it (and not everyone can) it’s worth it. Enjoy your VW! Should be a good reliable car. And parking gets easier with practice…. That is, if you can find a space. Good to know that you were able to get some help from the state. A little tricky, was it? @3:14 More than a little! It just took a loooong time. I’m used to moving fast when I decide but this was a government agency. They were extremely helpful and great to work with, but bureaucracy is bureaucracy.